Advertisement or order form for woolen goods. 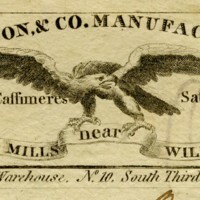 W. Young, Son, & Co. Advertisement, 1816(? ), William Young Papers, Folder 2, Delaware Historical Society, Wilmington, Delaware. “W. Young, Son, & Co. Advertisement,” DelaWARES.org, accessed April 23, 2019, http://delawares.org/items/show/118.